I admit to assuming what many moms probably assume – that our home is safe, our town is safe, and therefore my child’s faith will be safe. It’s college professors who will try to shake my child’s Christian beliefs, and he’ll be ready by then. Right? Ladies, this is a dangerous mistake. Even if you think you’re in “Mayberry,” let me assure you: you aren’t. That sticker represents what we can’t afford to ignore: growth of evangelistic and committed atheism. And remember, the “skeptic kids” sticker was on a car exiting an elementary school, not a college campus. As we Mama Bears say, apologetics might not affect our faith, but it might affect our children’s. And you know what? I want my churched-up, prayed-up, pre-school kid to be a skeptic too! Why? Because being a skeptic means that he will question what is presented to him. This is important because I will not always be the one presenting the ideas. A child who understands how to discover truth is primed for a faith that lasts much longer than that of a child who is merely presented with the truth. I am confident that if I train up my little skeptic to discover truth (i.e. engage in critical thinking), then he will ultimately land at the cross of Christ. Why am I confident about this? Because after much study, I am convinced that Christianity is a reasonable, rational, defensible faith. I have studied the truth propositions of Christianity and the Bible; both hold up to rigorous academic scrutiny from the disciplines of science, history, literature, and philosophy. But when it concerns my son’s faith, it doesn’t matter that I know this. The question is will he, or will he merely take my word for it only to have an atheist pull it apart later? As parents, we can sometimes have tunnel vision when it comes to raising our kids in the faith. After all, we are directly responsible for helping shape their worldviews (i.e. the framework by which they evaluate truth claims.) However, we are called to shape much more than just our own children. We are called to impact culture, and that begins with our own spheres of community influence. Seeing that car’s sticker started a chain of thoughts in my mind, and a burden in my heart. What would it have looked like if I had met this mom while sitting on the playground? What about other moms? Would they know what to say? What kinds of opportunities are we missing on a daily basis because we stay safe in our own little bubbles, content with our own knowledge and just raising our own kids? 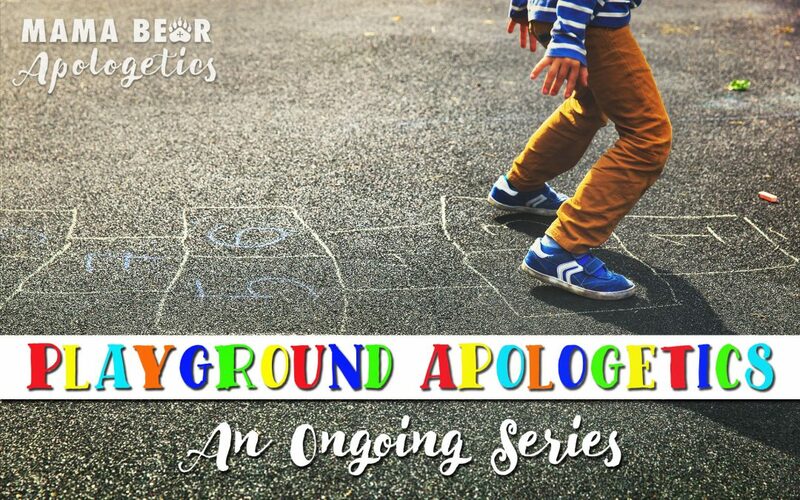 To help us make the most of these valuable opportunities, we at Mama Bear Apologetics present a new series: Playground Apologetics! As moms, we do not always have the time for extensive ministry outside the home, especially when our kids are young. But we can defend our faith and further the Kingdom right where God has planted us, even if that’s on a park bench. Playground Apologetics is your how-to-guide for starting conversations that matter. We will report back to you from real conversations and tell you what worked. . . and what fell flat. Even if your kids are too old for the playground, perhaps you regularly find yourself sitting on the sidelines of a baseball field, or behind the scenes at a cheer competition. Wherever you are, that’s where the Kingdom needs you. Let’s take a moment to talk about what Playground Apologetics is not. It is not a manual on how to be the weirdest Mom on the playground. It is not a formula by which you will ostracize your kids from their peers. It is not a recipe for being fake, and scripted, or having canned answers to all of life’s questions. It is also not a game-plan for combative and confrontational experiences. Come with us on this adventure, Mama Bears! Let’s leave the cave for a bit and spread the Good News! We hope this series will help you engage in more apologetics without even changing your schedule. You can say yes to that! It will be a walk in the park. Hillary Short (aka, the “other” Hillary!) lives with her husband, son, dog, and lots of carpet in the Texas Hill Country. 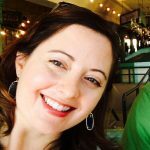 She teaches Senior Thesis at a Classical and Christian school and dreams of wood floors, finishing thoughts, and finding things on the first try. Thanks for reading! There should be an option to subscribe located below the comments section. Please let us know if you don’t see it. Thank you so much! Soli Deo Gloria. Why worry about your kids losing their faith? If you’re as confident in the truth of Christianity as you say you are, kids getting smarter and more logical and more skeptical only works in your favor. The evidence should continually be pushing them toward Christianity, right? On the other hand, I think your concern is well founded. I don’t think Christian claims can stand up to a serious critique. What frustrates me is this hypocrisy–saying that Christians can rest easy knowing that they’ve backed the right horse … but watch out for those darn atheists because our kids’ faith is brittle! Bob, thank you for commenting! You bring up some excellent points. It would be naive for me to claim that there is absolutely no evidence against Christianity. There are a lot of good objections. However, the objections are often superficial, but very emotionally powerful. People often get so wrapped in the power of an emotional objection that they stop looking for more answers. In my experience, if you keep digging past the emotional or superficial objections, you find answers that are much more compelling, much more coherent, and much more satisfying. Absolutely I should be worried that my child will stop at the emotional and/or superficial objections, and think that the only thing beneath the surface of Christianity is unanswerable questions! Many parents are terrified that their kids will discover those objections because they themselves don’t know how to rebut them. I think that is foolish. I want my child to question everything, and hold on to what is good. (1 Thessalonians 5:21) I am not naive though. I am fully aware that if he starts digging and gets tired of looking, then he’ll end up with a handful of doubts with no answers. You are correct in saying we believe we “backed the right horse.” After much study, I’ve found what I consider compelling, convincing, and satisfying answers to most of Christianity’s objections. But like I said in the post, it doesn’t matter if I have done this. Has my son found these answers as well? We as parents can’t guarantee that our kids will keep digging past the tough objections. But we can do our best to facilitate it, which is what Mama Bear Apologetics is all about! Love the way you’re thinking! So true: instead of just presenting the truth we need to teach our kids to discover the truth for themselves. God help us with this massive task! Thanks for starting this exploration of apologetics. I think it will be much needed in our children’s live and look forward to it with interest. I am in Australia, and our culture is “further ahead” in terms of families being skeptical about Christianity (with one state trying to ban primary aged children even mentioning Jesus in the playground). My oldest son (who is 9) has already had arguments with other children at school about the existence of God, Jesus, God’s sovereignty, etc. I say arguments because that’s how he explains them to us – I have no idea whether he tries to be winsome or not!! He has already encountered children from atheist, agnostic, sikh, buddhist, hindu, muslim, and Christian families and most seem quite happy to engage in questions of faith with each other. Thank you so much for writing. I am a stay at home mom who recently discovered apologetics and am fascinated with it! I love the real life examples! I always thought of myself as a dumb blonde with the fashion degree but now I a m debating on getting a second degree in apologetics as it is such a facination if mine. Glad to see I am not alone!